ROCKVILLE, Md., Oct. 31, 2018 /PRNewswire/ -- Choice Hotels International, Inc. (NYSE: CHH) continues to expand its international footprint with 40 hotel openings planned this year in Latin America and Spain. This includes introducing the first Choice Hotels brands in Spain and Colombia, as well as opening hotels in Brazil, Ecuador, Mexico, and Panama, adding nearly 5,000 rooms. 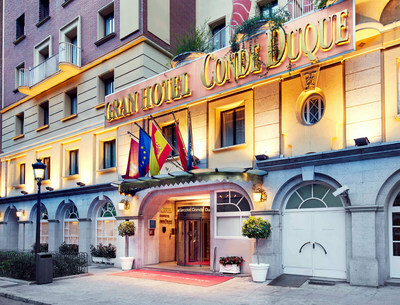 Spain: 16 Ascend Hotel Collection properties were introduced through Choice Hotels' recent alliance with Sercotel, a leading hotel operator and franchisor based in Spain. Another eight Ascend properties are expected to open before the end of the year. Brazil: Three Sleep Inn hotels and one Quality Inn hotel were opened by Atlantica Hotels, Choice Hotels' master franchisee in Brazil. In addition, two Comfort hotels, one Clarion hotel and one Quality Suites hotel are expected to welcome guests by year end. Colombia: One Clarion hotel opened and two Ascend properties are expected to open in December, all through the Sercotel alliance. Mexico: Choice Hotels Mexico has opened two hotels under the Comfort and Sleep Inn brands. A Comfort Inn hotel is expected to open in December. Panama: An Ascend Hotel Collection property opened through Sercotel. Ecuador: Developer Real Hotels & Resorts opened an Ascend Hotel Collection property, their second in the country. "We continue to expand and reach new markets all over the world– from Bogota, Colombia, and Cabo San Lucas, Mexico, to Sao Paulo, Brazil, and Barcelona and Madrid, Spain," said Mark Pearce, senior vice president, international division, Choice Hotels. "Our tremendous progress shows our international strategy is working. We continue to forge relationships with high-quality, multi-unit developers and operators for long-term agreements in strategic markets." Choice Hotels International, Inc. (NYSE: CHH) is one of the largest and most successful lodging franchisors in the world. With more than 6,800 hotels, representing more than 550,000 rooms, in over 40 countries and territories as of June 30, 2018, the Choice® family of hotel brands provide business and leisure travelers with a range of high-quality lodging options from limited service to full-service hotels in the upscale, midscale, extended-stay and economy segments. The award-winning Choice Privileges® loyalty program offers members benefits ranging from everyday rewards to exceptional experiences. Ascend, Ascend Hotel Collection, Clarion, Comfort, Comfort Inn, Quality Inn, Quality Suites and Sleep Inn are registered trademarks of Choice Hotels International. For more information, visit www.choicehotels.com. This communication includes "forward-looking statements" about future events, including hotel openings. Such statements are subject to numerous risks and uncertainties, including construction delays, availability and cost of financing and the other "Risk Factors" described in our Annual Report on Form 10-K, any of which could cause actual results to be materially different from our expectations.